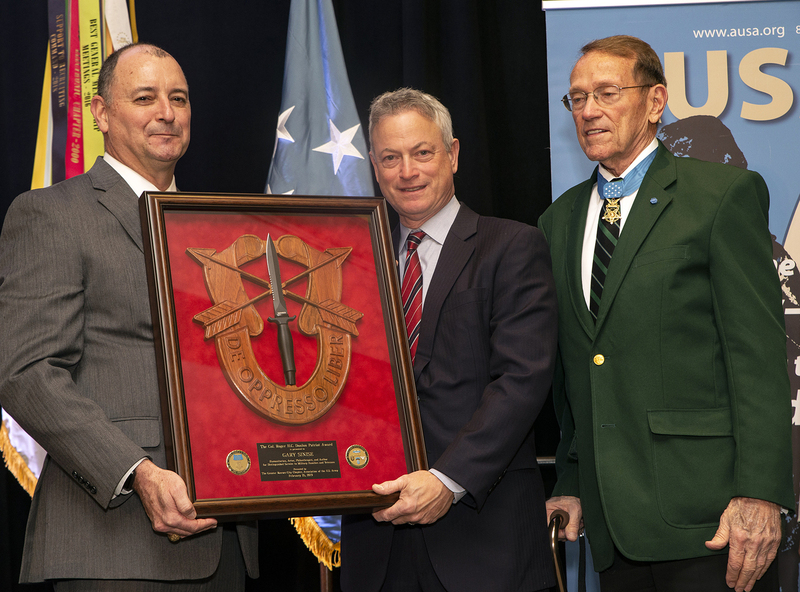 The Association of the U. S. Army’s Greater Kansas City Chapter recently recognized humanitarian, actor and philanthropist Gary Sinise’s almost 40 years of exceptional support to veterans, service members and families with the inaugural presentation of the Colonel Roger H.C. Donlon Patriot Award. The award honors Donlon as both the first U.S. Army Special Forces soldier to receive the Medal of Honor and its first recipient in the Vietnam conflict. Donlon personally presented the award to Sinise before an audience of more than 370 veterans, service members and members of the Kansas City community who filled the Count Basie Ballroom of the Kansas City Downtown Marriott. Friends for over a decade, the two shared a heartfelt embrace as Sinise received the framed U.S. Special Forces insignia carved in Brazilian Cherry wood, with stiletto, set on the red field of the 7th Special Forces Group. Seven current members of Operational Detachment A-7126 and a three-person team from the 7th Special Forces Group traveled from Eglin Air Force Base, Fla., for the event. These quiet professionals joined their fellow soldiers alongside active-duty members of the Marines, Navy and Air Force. Present in their service dress uniforms, they stood out from among the scores of veterans and civilian members of the Kansas City community. Those present included members of the Special Forces Association, seven retired general officers, the civilian aides to the secretary of the Army for both Western Missouri and Eastern Kansas, and the organization heads of several of KCAUSA’s Community Partners. The turnout was tremendous and provided proof of the great esteem held for Donlon and Sinise by both local veteran and civilian members of the community. Their personal friendship helped make the inaugural presentation of the Colonel Roger H.C. Donlon Patriot Award highly memorable. Donlon retired from active duty in 1988, and following his distinguished military career has ceaselessly volunteered his time and energies in supporting the nation and his community. As a captain on July 6, 1964, Donlon led his 12-man Special Forces team alongside 300 South Vietnamese soldiers in successfully defending the Nam Dong Special Forces Camp against a concerted, two-day attack from two Viet Cong battalions with a combined strength of well over 800 communist fighters. President Lyndon B. Johnson presented him with the Medal of Honor on Dec. 5, 1964. Sinise, who played Lt. Dan Taylor in the movie Forrest Gump, is the author of Grateful American: A Journey from Self to Service, and continues giving back to those who sacrifice for our nation and encouraging others to do the same. Sinise has committed his time and energy to veterans since the early 1980s, beginning with “Vets Night” free dinner performances for Vietnam veterans at the Steppenwolf Theater in Chicago. This is not the first time Sinise has been honored by AUSA. At AUSA’s 2017 Annual Meeting and Exposition, he received the George Catlett Marshall Medal, the highest award for service to the nation presented by the association. The Greater Kansas City Chapter is especially grateful for the generous support of Country Club Bank, Shawnee Mission Kia, CZ-USA, Friends in Service of Heroes, the Ewing Marion Kauffman Foundation, Armed Forces Bank, Demaranville & Associates, Honeywell, Kamo Adventures, Valiant Integrated Services, Veterans of Foreign Wars, Armed Forces Insurance, Hodgdon Powder, the Spencer C. Duncan Make it Count Foundation, and Red Team Thinking. The Greater Kansas City Chapter will host its annual Army birthday celebration dinner on June 15 at the Kansas City Downtown Marriott.